Just back from Normandy where I’ve been touring the beaches and cliffs of the Normandy landing area where the invasion of France that led to the end of the 2nd World War took place. It was an emotional trip even though no one close to me had died in the horror that was unleashed that day, but one cannot fail to be moved when confronted with a cemetery containing 10,500 white crosses each one guarding a fallen combatant. 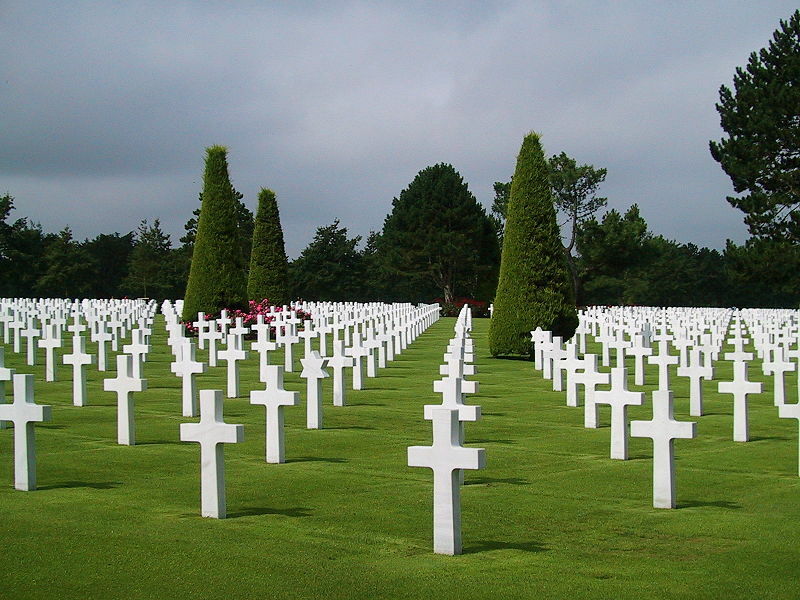 It was June 6th, 1944, when the assault on the French coast took place. Every type of transport at the Allies disposal was thrown into the battle and incredible ingenuity allowed Bailey bridges and the Mulberry pontoons to be shipped across the Channel without the Germans knowing. Horsa gliders towed by ‘planes carried the British 6th Airbourne Division across the channel to storm the bridges at Ranville-Bénouville (known today as Pegasus Bridge). The most intensely fought over sands, the six-mile-wide Omaha beach, largest of all the five beaches on the coast (Gold, Juno, Sword, Omaha and Utah) was to be taken by the US 1st Army led by Omar Bradley. The plan was to land infantry troops alongside armoured amphibious Sherman tanks, but the Shermans never made it. The tanks were released from their landing craft too far away from the beach as there was a much greater swell further out to sea than the Americans had bargained on and all but two of the tanks sank shortly after leaving their craft. Many units landed in the wrong place due to the strong tides and winds carrying the landing craft away from their positions. Omaha is most remembered for the casualties the Americans took there as the German machine gun fire tore into the troops as they tried to sprint across the beach to the seawall. It was a massacre, a terrible loss of life. Although Hollywoodish, the film The Longest Day, gives a very good impression of what that day in June was like. I watched it before I departed for France and again on my return a few days ago when I was able to recognise some of the places I’d visited. The weather didn’t favour the invaders, nor did it favour me as I walked in their footsteps: Normandy is famous for its changeable climate. 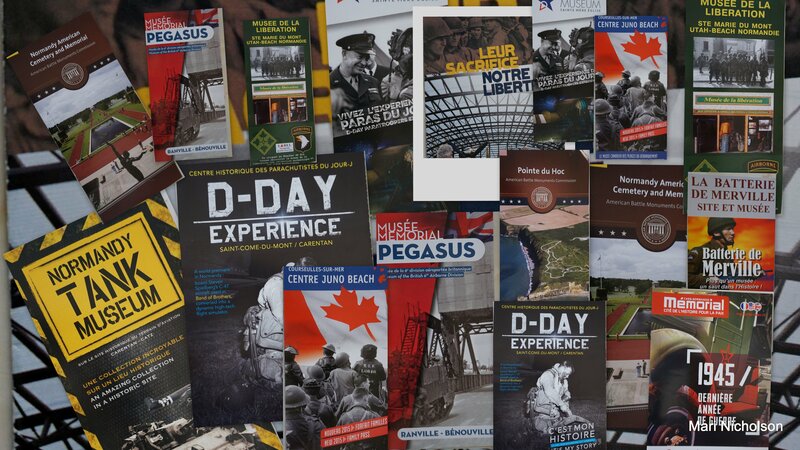 There are many wonderful Museums, and I’ve appended photographs of their leaflets below, but if there is time for only one or two, make it (1) The Memorial of Caen in the town of the same name and 2) Pegasus Museum. The Memorial of Caen, as well as artefacts, has lots of cinematic clips and chairs on which to rest while you watch – a boon for many people. It also has a great restaurant and a good snack bar/cafe. I was there for 4 hours but could have done with 6, and I didn’t have time to tour the bunker, nor to visit The Cold War Exhibition which I was told was excellent. Pegasus Museum has the bridge, a replica of the glider that landed just a few yards from it, and another glider in the grounds into which you can climb for an exploration of the conditions in which the parachutists made that journey across the channel. 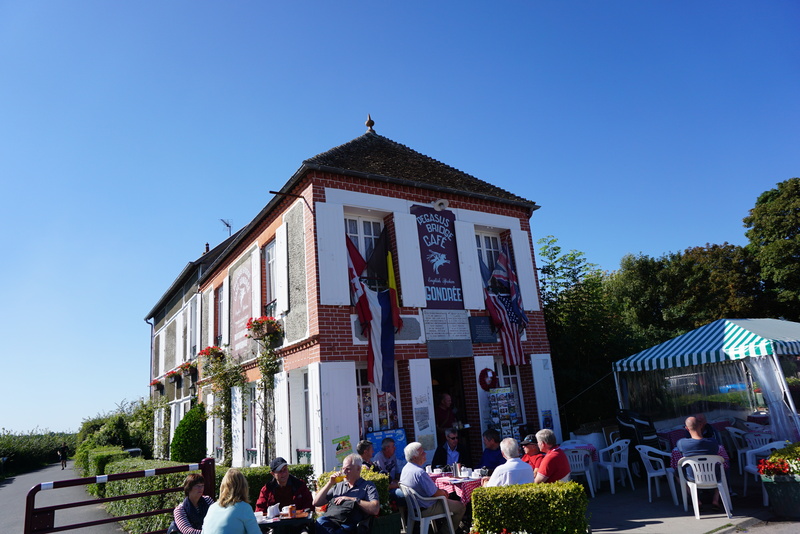 In the area also is the original cafe in which Major Howard set up his HQ shortly after he landed, and where the tea and coffee are pretty good. Major John Howard’s Headquarters immediately after landing at Pegasus Bridge. Today known as The Pegasus Bridge Cafe it i still in the hands of the family who owned it in 1945. I hope to blog about individual beaches in due course. Thanks, Janet. Not a very ‘full’ history, more of the ‘my travel through historical eras’ type of piece but I wanted to get something down of how it seemed to me.